Cows are massive resource users. Along the way to maturity, they consume feed that requires considerably more land and irrigated water than most other animals. Then, because they are ruminants, their digestive system creates an abundance of methane. Just from one cow’s (mostly) burps, you get yearly emissions that equal a whopping 235 gallons of gasoline burned by a car. So, knowing a cow’s environmental impact, let’s assume you decide to eliminate one 5-ounce steak a week from your diet. 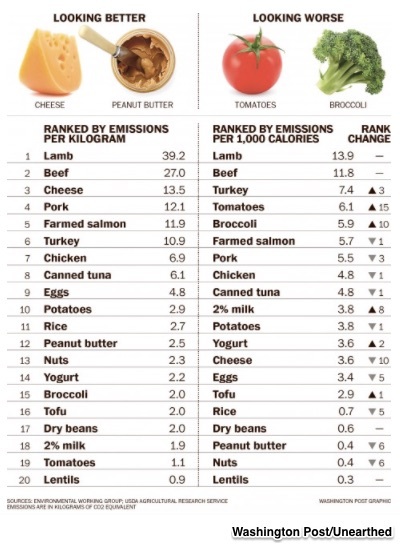 What you stop eating is only a part of the environmental equation. Your impact depends on what you start eating. And that takes us to calories. When you sacrifice a steak, you still need the calorie equivalent in your diet. The list on the righthand side below presents the possibilities. As economists we know that every decision has an opportunity cost–a sacrificed alternative. We should also keep in mind though that for environmental decisions, it is never as simple as it looks. Especially with steak, there is never a free lunch. However, that less costly alternative (and perhaps the downside) could be more lentils. My sources and more: An excellent econtalk podcast on food costs took me to Tamar Haspel’s consistently fascinatingWashington Post columns, Unearthed. From there, the possibilities became endless but I do recommend these papers, here and here. Please note that our featured image was from the Washington Post.